The intensive monitoring plots (Level II) of ICP Forests serve to examine the effects of air pollution and other stress factors on forest condition, including tree vitality. However, tree vitality cannot be measured directly. Indicators, such as tree growth or crown transparency, may instead be used. Tree growth processes can be ranked by order of importance in foliage growth, root growth, bud growth, storage tissue growth, stem growth, growth of defence compounds and reproductive growth. Under stress photosynthesis is reduced and carbon allocation is altered. Stem growth may be reduced early on as it is not directly vital to the tree. Actual growth must be compared against a reference growth, such as the growth of trees without the presumed stress, the growth of presumed healthy trees, the growth in a presumed stress-free period or the expected growth derived from models. 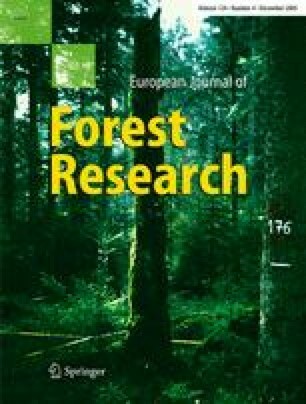 Several examples from intensive monitoring plots in Switzerland illustrate how tree-growth reactions to environmental stresses may serve as vitality indicator. Crown transparency and growth can complement each other. For example, defoliation by insects becomes first visible in crown transparency while stem growth reaction occurs with delay. On the other hand, extreme summer drought as observed in large parts of Europe in 2003 affects stem growth almost immediately, while foliage reduction becomes only visible months later. Residuals of tree growth models may also serve as indicators of changed environmental conditions. Certain stresses, such as drought or insect defoliation cause immediate reactions and are not detectable in five-year growth intervals. Therefore, annual or inter-annual stem growth should be assessed in long-term monitoring plots. Tree growth Vitality Crown transparency Stress factors Drought. The Swiss Long-Term Forest Ecosystem Research (LWF) is part of the Swiss Forest Investigation Programme conducted by the Swiss Federal Institute of Forest, Snow and Landscape Research WSL in co-operation with the Swiss Federal Forest Administration. Many thanks to the various field teams and that have assessed the trees on the LWF plots, to Christian Hug for coordinating the fieldwork, to Michèle Kaennel Dobbertin and to the anonymous reviewers for helpful editorial comments.